There’s an all-star list of performers who have done magical things with the 88 keys of the piano, but these four are near the top for me. New Year’s Day 1998 was a sad one for me. The cold headline—there in black and white, just like those 88 keys—banged out the news. Floyd Cramer, one of the architects of the Nashville Sound and master of the slip-note-piano-playing style, had slipped away the day before. One of my bucket-list concerts was to hear Floyd play “Last Date.” To console myself, I struggled for a year to learn to play a sloppy version of his signature song. I never practiced enough to do the song or him justice, but the in-the-back-of-my-mind jukebox plays it perfectly. 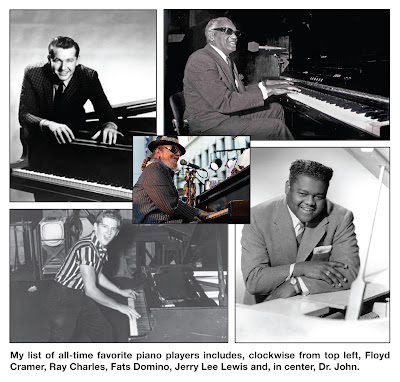 I didn’t make that I-could-have-should-have blunder with my all-time favorite, Ray Charles. In January 2003, when Gov. Sonny Perdue celebrated his inauguration, I heard Ray wail, “Georgia, Georgia ….” As a small boy, Ray fell in love with the piano. He said that once he discovered he could “mash” those keys, that’s what he wanted to do. Pair that “mashing” with his soulful voice, and we were blessed with a genius. With a few phone calls, our senior editor, Phil Hudgins, tracked down the legend’s agent. “Yes,” he said, “Fats might be interested in coming to Georgia.” All we needed to do was send half of the $50,000 fee, while guaranteeing 12 first-class airline tickets, 12 first-class hotel suites and enough limousines to transport Fats and his band. If we did that, Phil was assured Fats would consider the invitation. So much for feeling sorry for the not-so-much-in-demand Domino. Still, when I read of Fats’ obituary, I mourned and hummed a few bars of “Ain’t That a Shame.” To lift my spirits, I punched in Malcolm John Rebennack on YouTube and listened to “Right Place, Wrong Time.” With his growly, bluesy voice and his jazzy, boogie-woogie touch of the 88 keys, Grammy-winner Dr. John, as Fats did, has made a big name for himself in the Big Easy and beyond. Before I read another you-waited-too-long headline reminder about Dr. John, I need to get busy to be in the right place in the right time for an upcoming concert.